If you are a follower of Upland Equations, you may already heard about my new book, Heaven on Earth: Stories of Fly Fishing, Fun & Faith, which was officially released on April 1, 2012. In the archives you will find several posts with links to the numerous reviews the book has already received. The Lord has a special place in his heart for fishermen. For lawyers, not so much. When a guy who deals daily with the collision of these conflicting worlds has the temerity to author a book, you wonder whether anything coherent can result. This singular miracle, however, is now in print. 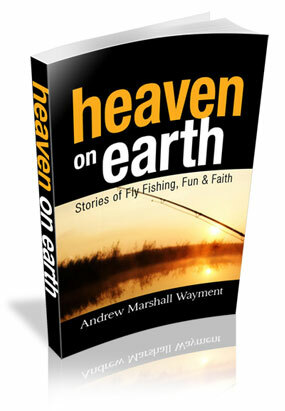 In Heaven on Earth: Stories of Fly Fishing, Fun & Faith, Andrew Marshall Wayment, a diehard fisherman and attorney, negotiated his personal contradiction with such style and grace as to transport you to a place of joy and peace. This book is a collection of stories from the author’s life with the pastime of fly fishing as the primary subject matter. However, in a nation where it is quickly becoming taboo to even mention God or things of a spiritual nature, the author bucks this trend and uses fish and fishing as a vehicle to share deeper spiritual principles. Hopefully, in reading this book of fishing stories you, too, will find a little Heaven on Earth. To help promote the book, I created a website to share more about it and also set up a Pay Pal function where you can actually purchase signed copies. Earlier this week, I updated the website with thirteen of the reviews that have come in so far. For those who are interested in learning more about the book and reading these reviews, here is a link to the website: http://www.heavenonearthbook.com/. Check it out and let me know what you think! Thanks for stopping by! Keep Fishin’ with Faith! Next Post CHECK OUT ANDY WAYMENT’S ARTICLE, "TEN FLIES FOR IDAHO GUYS . . . AND GALS."